Today we head for the region of Tirol, where we will visit the towns of Kufstein, Kitzbuehel, Rattenberg, Hall and Innsbruck. 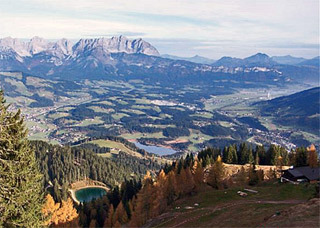 In medieval times Tirol was known as "land in the mountains". This is the place for enjoying unspoiled nature year round, hiking or skiing the high mountains and glaciers, walking or biking the forested trails or swimming in the crystal lakes. At the end of the day, relax in a mountain farmhouse or spa resort or in rental accommodations in one of the quaint villages or towns. This is a land of traditional festivals, fun happenings with food and drink and many opportunities for making new friends. 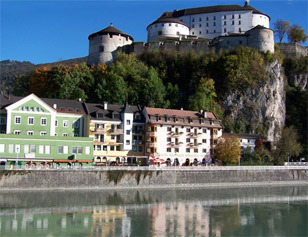 Our first stop was the fortress town of Kufstein on the banks of the River Inn. We checked our bags at the train station (Note that the main train stations have elevators, which makes traveling with luggage very easy.) and crossed the bridge over the river to the Unterer Stadtplatz with its striking fountain dating back to 1863. On the recommendation of a friend, we headed directly to the Hotel Andrea Hofer at Pirmoserstrasse 8 for lunch. The dining room was designed with an eye to privacy and intimacy with good space and attractive dividers between tables. A large white fireplace in the center gave the room a warm appeal. We had two marvelous seasonal dishes. Tender roast deer, infused with carrot and bacon, was served with red wine cabbage, chestnuts, dumplings and spaetzel. A large duck breast, roasted medium rare in a cranberry and balsamic sauce, was served with red apple cabbage and gnocchi. After a delicious cup of hot coffee we were ready to tour the town. The service was wonderful and the prices quite reasonable for such food and environment. The Fortress sits majestically above the town and the region. There is a cable car but we decided to work off our lunch via the Ganngsteig (covered walkway) which was hewn out of the rock. The Civic Tower houses the famous Heroes' Organ; built in 1931 it was the first open air organ in the world. It is played daily at noon and, in July and August, also at 17:00. The Deep Well was built between 1512 and 1537 with a shaft depth of 57.6 meters. The huge water wheel had been powered, hamster-style, by prisoners. Prison cells are intact in the Emperor's Tower, the former state prison. Historical information about the prison and some of its famous prisoners is on display. Archeological artifacts are on view in the upper Castle Barracks while the adjoining Fortress and Heritage Museum houses a wonderful collection of armor and armaments, prehistoric animal skeletons, artifacts, portraits, religious symbols and more. We took the cable car down, just for the experience. 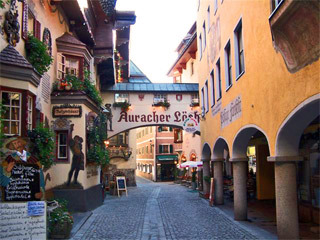 Rommerhofgasse, a cute street that runs along the river, is an important part of the old town. Bold, colorful murals on the buildings exteriors depict the history of Kufstein. Well known for wine houses Auracher Lochl and Batzenhausl, it is home to the monument to Karl Ganzer, the composer of the world famous Kufstein song "The Pearl of the Tirol". Kufstein is also home to the famous wine glass company Riedel. 2000 years have passed since glass blowpipes were first used in Rome. The factory here in town still uses this ancient method. We had been hoping to see an exhibition of the craft, but it was not open to the public this day. We learned that the sewing machine was invented here by Josef Madersperger. Since nobody was willing to buy it, he donated his first functioning machine to the Polytechnische Institute in Vienna. The Madersperger museum on Kinkstrasse gives an interesting insight into Madersperger's life and the way his invention changed clothing from luxury item to a mass market product. We claimed our bags and were off on a thirty-four minute train ride to Kitzbuehel where we would overnight. There are two train stations in Kitzbuehel, the main one and the Kitzbuehel-Hahnenkamm, which are about 3 minutes apart. We disembarked at the latter, since the Golf-Hotel Rasmushof, was just a 10 minute walk from there. The colorful, historic streets of town have their share of charm and are filled with fashion, food and drink with lots of appeal for visitors in any season. 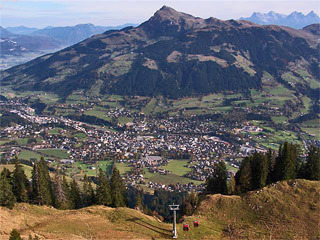 Kitzbuehel, in the heart of the Alps, is famous primarily for skiing and we were staying in a hotel on a golf course. We don't ski or play golf - what are we doing here? Stay tuned. The Rasmushof, with its comfort, hospitality and charm is just what youd expect in an alpine retreat. The fluffy white comforters and pillows on the twin beds looked very inviting. Our room was done in soft rose hues with lovely fabrics and built-in closets and matching furniture. The bathroom had fine quality fixtures, towels and amenities. The toilet was in a separate room with its own small sink and towels. Pretty inside but outside - gorgeous - a perfectly manicured fairway with green slopes climbing up the mountain spotted with clusters of trees and picturesque homes. We thought about taking a dip in the indoor pool but it was getting to be dinner time and the cozy dining room was beckoning. Done in light alpine woods with an attractive fireplace, the room, surrounded by nature, invites total relaxation after a day of sport or touring. We enjoyed a delicious medium dry house white wine as an aperitif. Linda had medallions of pork in mushroom cream sauce with linguine, spinach and cherry tomatoes. A very happy camper was she as was I with a fresh tender duck breast, chestnuts, red cabbage and outrageously good pumpkin gnocchi. The generous breakfast was of a standard that could easily become a habit, as could Golf-Hotel Rasmushof, even if we don't play golf! The gorgeous grass-covered mountains of the Kitzbuehel Alps, a paradise for walkers, hikers and bikers from early summer to autumn, in the winter becomes one of the most outstanding ski destinations in the world. The region catches the snow- laden north-westerly winds, which ensure lots of snow down to the valley floor, even if the grassy mountain slopes up to 2000 meters require less snow for perfect skiing and snowboarding. There are 59 groomed and signposted trails and about 90 miles of perfect pistes, 9 off-piste trails and an illuminated trail for evening skiing. Fifty-four modern cable cars and lifts carry you to the top, including the new and unique 3S Bahn tricable gondola that soars across the deepest ravines. So what if we don't ski, let's find out what we are missing! Across from the Hahnenkamm train station is The Bergbahn, where we boarded a cable car for the steep ride, with lots of photo ops, to the famous launch point of the downhill race course, the "Streif". A trip to the starters hut and a glance down the run convinced me that those who compete here are a courageous lot. We were happy to see Canadian Steve Podborski amongst the past winners photos on the walls. The 66st International Hahnenkamm Race will be staged in Kitzbuehel from Jan. 20 to 22, 2006. The worlds best ski racers will compete in the alpine disciplines of Super G, downhill and slalom, the traditional Hahnenkamm Champion will be determined by the fastest combined total time. The mountain air and glorious scenery was invigorating and it was easy to see why so many come to take advantage of the great outdoors here on the Hahnenkamm. We met a fellow, a big strong well-conditioned fellow, who suddenly appeared over a rise. He had just completed his daily Nordic walk up the Hahnenkamm. He wasn't even breathing hard! We were suitably impressed. Nordic walking is extremely popular here in Austria. On a plateau near the cable car station is the Restaurant Hochkitzbuehel and a fabulous ski museum which traces the history of the sport from clothing to equipment with photos and records of memorable moments in the sport. The history of cable cars and chair lifts is traced through pictures and actual models. The attractive restaurant has a large terrace with spectacular views and a conference room which is used for business meetings and seminars. Hot chocolates enjoyed, we were ready for the visual feast as the cable car descended to the valley below. At the bus stop, a few minutes walk from the hotel, we caught the postbus, which dropped us right at the main Kitzbuehel station, where we took the train to our next destination, Rattenberg.